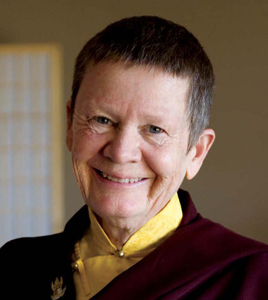 Pema Chödron is a renowned and beloved teacher of meditation and Buddhism. Her teaching has inspired millions of people from around the world who have been touched by her message of practising peace and compassion in these difficult times. She is widely known for her charming and down-to-earth interpretation of Tibetan Buddhism for Western audiences. While in her mid-thirties, Pema travelled to the French Alps and encountered Lama Chime Rinpoche, with whom she studied for several years. She became a novice nun in 1974 while studying with Lama Chime in London. His Holiness the Sixteenth Karmapa came to England at that time, and Pema received her ordination from him. Pema first met her root teacher, Chogyam Trungpa Rinpoche, in 1972. Lama Chime encouraged her to work with Rinpoche, and it was with him that she ultimately made her most profound connection. She studied with Trungpa Rinpoche from 1974 until his death in 1987. At the request of the Sixteenth Karmapa, she received the full monastic ordination in the Chinese lineage of Buddhism in 1981 in Hong Kong. Pema served as the director of Karma Dzong, in Boulder, until 1984, when she moved to rural Cape Breton, Nova Scotia to be the director and resident teacher of Gampo Abbey, the first Tibetan monastery for Westerners. Founded by Chogyam Trungpa Rinpoche in 1984, Gampo Abbey is a Western Buddhist Monastery and retreat centre in the Shambhala Tradition, located in Nova Scotia, Canada. Under the direction of Sakyong Mipham Rinpoche, the spiritual head of Shambhala International, Gampo Abbey is guided by its abbot the Venerable Khenchen Thrangu Rinpoche and principal teacher Acharya Pema Chodron.